The first manifestation of this ‘project’ (I thought it might have been a book but for now it is this blog) was a notebook begun on the 9th of December 2010. This was an attempt to record different kinds of encounters with music…though not the music I selected and listened to. So I listed all the albums I bought, the gigs I went to, the music I found (mostly discarded CD-Rs) and I recorded instances of sound ‘made visual’ in various walks around my neighborhood. Then I started to write down memories of particular places associated with music in my past. All of this had an echo of projects by Georges Perec – particularly An Attempt to Describe a Number of Places in Paris and Je Me Souviens. there is a clip of Howard McGhee playing Shades of Blue but there is no explanation of why it is there. I found other stuff though. In the biography, David Bellos documents youthful sessions where Perec and his best friend would listen to sought after ‘west-coast jazz’ albums. In Perec’s Je me Souviens (published by Hachette in 1978 and not, as yet, translated into English)) – a numbered list of apparently random memories – there are (according to Perec’s index) 20 references to jazz. 4. I remember Lester Young at the Club Saint-Germain; he wore a blue silk suit with a red silk lining. 6. I remember that Art Tatum called a piece Sweet Lorraine because he had been in Lorraine during the 1914-18 war. 41. I remember a piece by Earl Bostic called Flamingo. 87. I remember when Caravan by Duke Ellington was a rare record and that, in those days, I knew of its existence without ever having heard it. 223. I remember record sleeves, most often jazz ones, drawn by David Stone Martin. 301. I remember Sidney Bechet wrote an opera – or was it a ballet? – entitled The Night of the Sorceress. But none of this gets me any closer to working out the question about the jazz record and the can of petrol. 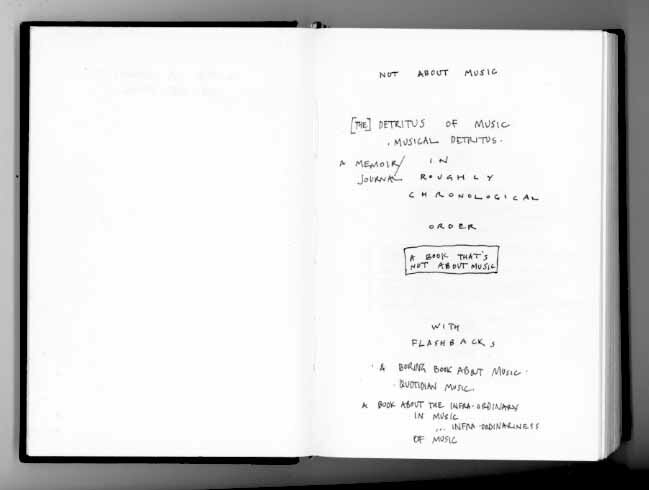 This is the second page of the notebook with various attempts to give the project a subtitle (it was already called ‘Like a Hammer in the Sink’ by then). Great stuff. Had me scratching my head as well. It sounded like it should be a Perec list and also had a recollection of reading something similar. However, I think it is a chapter in Jacques Réda’s ‘The Ruins of Paris’. He lists all his purchases on a Sunday including the street where he bought them. The list includes 6 bottles of wine, three pencils, two school exercise books and tries to buy some petrol but the pump is out of order which forces him to pedal his moped home. He also buys a jazz record which is “A Bud Powell record reissued by a Japanese Company”. Long time since I’ve read this so may give it another whirl. Love how your blog is developing. Cheers. Thank you…I hoped someone out there would recognise the piece in question and am impressed with your recall…I thought it might be Calvino from ‘Hermit in Paris’ but I had forgotten Jacques Reda. I will now start the search for ‘Paris in Ruins’ around the house…it is here somewhere. Also thanks for encouraging words. My recall is not that great!. Thought it may have been Reda and luckily have a copy of the book so found the relevant chapter! It’s a bit of a challenge to recall anything these days!. Look forward to more posts.